An Inspector Calls has been a perennial favourite of the English syllabus in schools and still remains so. Comments by groups of school parties after the performance at The Lowry ranged from ‘Wow!’ and ‘Brill!’ to the more controlled ‘An amazing evening!’ and ‘Really enjoyable’. As I arrived coaches were departing for, and arriving from, different parts of the North West and beyond. What seemed like an army of young GCSE students was leaving the earlier matinée performance, pouring down the stairs like the hordes of Hannibal’s army over the Alps, but thankfully more triumphant and peaceful, milling around in excited chatter, lingering in the foyer or leaving; and then another invading army of young theatre-goers approached, sweeping up the stairs like a surging wave to pack the theatre for the evening performance. All were enthusiastic, glad to talk, happy to be part of the experience. This must say something about the enduring appeal of Priestley’s play, and not simply because it is a ‘set text’; this production in particular crosses generations, decades and oceans. It is spectacular, visually stunning, extremely well crafted, and, just as importantly, thought-provoking. The production is on tour until 26th May, with short runs in many theatres covering venues across the whole of the United Kingdom. It is a demanding schedule and it was a fortunate opportunity to see it at The Lowry. The stage behind the proscenium arch has been reinvented with an almost hypnotic architecture which, together with the lighting, colour, sound and special effects, creates a language of its own, choreographed almost as a shifting, chromatic statement in sound and colour, in unison with the dialogue and actions of the Inspector and the dissolving world of the Birlings. 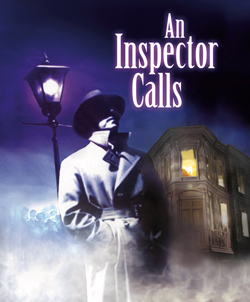 An Inspector Calls, written in 1945 with the ending of the Second World War, is set in the year 1912, two years before the outbreak of the First World War. The inference that Priestley saw his play as making statements about class and privilege, still relevant at the time of writing as they were in the Edwardian setting of the play, has been taken up in this production by the exciting, adventurous approach to the whole subject. Significantly in the 1950s and 1960s Priestley’s play was not so popular. Indeed, when he failed to find a theatre in Britain for its first production, he sent the script to Moscow where it was first performed in 1945. Public disillusionment with Labour Party politics, after its post-war General Election success, led to a desire for a break with austerity measures reminiscent of the immediate war years, exacerbated by the political and economic cost which the Labour Party confronted in its welfare reforms. Priestley’s social commentary was not in the interests of many people. A 1954 film of the play kept the emphasis on the tragedy of a family and, whether intentional or not, by changing the name of Inspector Goole to Inspector Poole, the film lost a key element of the idea that the Inspector is more than just a detective: in fact, he causes problems because he is not known officially as such and becomes a mysterious investigator of a family whose past is foreshadowing its future, whose guilt travels through time. When Harold Macmillan in 1957 stated that ‘most of our people have never had it so good’ he expressed an aspiration to forget the past, to move forward with an ideological materialism that both reflected and fuelled an American-style ‘dream’ of an unspecified future where the concept of the ‘nuclear family’, comfortably conformist, turned away from any serious discussion of pre-war social issues and where art and theatre were searching for a new energy. When revolt did come in the 1960s in England, it was in the form of a student protest, largely dominated by the children of the middle classes, a revolt which created its own momentum away from pre-War issues ending in the ‘hippy’ high until most of them joined either the Stock Exchange or the seedbed of New Labour conservatism. The quest for a ‘dream’ of happiness lost sight of inconvenient former truths which Priestley had portrayed in his writings. Beyond England, however, came a more serious engagement with art and philosophy as forms of revolt in the work of Brecht, Sartre, Franz Fanon and Americans such as Arthur Miller, Chomsky and Martin Luther King. Consequent upon this engagement with political issues in Britain, alternative theatre workshops, street theatre and political revolt began to connect with deeper issues in Europe and America. Even here, though, Priestley's setting of Edwardian England seemed remote, part of the historical problem, if considered at all and the interpretation of Priestley’s play focused simply upon the Edwardian period setting. Productions of the play in theatre and on television, largely dominated by an ‘establishment’ culture, adhered to a traditional Edwardian style upper class domestic world with echoes in those productions that focused on comfortable interpretations of other writers such as E. M. Forster and Evelyn Waugh. The questioning within literature was being reduced by film and television to an Upstairs, Downstairs version of social commentary. Birling, a ‘hard-headed business man’ in his words, was seen in some ways as a manufacturing version of this, a member of the aspirational monied manufacturing classes, in a vaguely safe way seen as ‘out of touch’, a victim of his class as much as an example of its worst aspects. Priestley had a different agenda in An Inspector Calls. When he sent the script to Moscow for its first production, he was making an important statement about the options he felt available for his political and social statement in the play. Arthur Miller, eleven years later, was to be brought before the Un-American Activities Committee (HUAC), accused of being a communist, and convicted of contempt the following year. Priestley’s own BBC wartime broadcasts were cancelled as being too left wing. To the shock of many admirers of George Orwell, and with much discussion since the knowledge was revealed in 2003, J. B. Priestley in 1949 was to appear on George Orwell’s list as possibly unsuitable as a writer for the then Labour Government’s Information and Research Department (IRD) on the basis that Orwell considered Priestley at least a communist sympathiser. Echoes here in today’s political climate of concerns for freedom of expression and the subterfuges of the famous or wealthy in hiding from the human consequences of their personal aspirations indicate the perennial popularity of the play in presenting issues that have not disappeared. Fortunately, the production in 1992 for the National Theatre with Stephen Daldry as director, seized upon the political importance of the play. This was followed last year with an updated version in the West End which had a very successful run, again with Stephen Daldry as director. Now on tour until the end of May 2012, it comes with a long list of accolades and awards with its portrayal of the hypocrisies, subterfuge and moralising of a wealthy, middle class, Edwardian ‘Brumley’ family whose wealth has come from manufacturing but beneath which a dark world unfolds on stage. Billing is T. S. Eliot’s ‘Bradford millionaire’ of The Waste Land (1922) – only, of course, he is a ‘Brumley millionaire’, created by a son of Bradford, set in the Midlands (Brum); in essentials Eliot’s and Priestley’s images are both identical in social attitudes. The current production addresses the continuing relevance of the play in a unique way. The actual setting of the stage, the furnishing, is one of the principle characters, a dominant mobile image of the Edwardian manufacturing owning class. Those in charge of design, lighting and music have created a spectacular reinvention of a domestic household within the space behind the proscenium arch by building a complete house that is also a product of a fantasy bordering upon a nightmare. It is magic realism on stage: a fairy tale reality that becomes a house of secrets and horror. The opening image of a warmly lit palatial interior receding into the rooms beyond, seen through the windows that create perspectives of grandeur, suddenly give way to a frontage that opens like a book revealing its contents to the world outside, simultaneously exposing nakedly the world within. It is a stage within a stage, like a puppet theatre, exposing a dining area where full-size characters seem both strangely comfortable and yet somehow part of a menacing fairy tale. The deceptively ‘old gold’ warmth of the interior lighting suggests a gilded cage. All this complements what the Inspector is unfolding in his conversations with the Birling family. It is not the job of the reviewer to spoil the narrative, the mystery and how it is developed in this production. Suffice it to say that the raised house, fittingly suggests the ‘upper’ floors of English society. It is a fantastic piece of furniture on the wider stage surrounded, by and opening, onto the cobbled world on the level below, lit by a gas lamp, furnished with an old-style telephone kiosk with all the nostalgia of a 1940s world. There was a distant echo of Carol Reed's classic film of The Third Man (1949) - impressionistic, almost monochrome at moments, charged with depth and with an authentic atmosphere presence in the world where the children, the serving woman Edna and the Inspector mainly dwell. These last two say little: their presence says so much like the boy and girl at the very beginning, making a powerful connection with the audience from the opening seconds. The magical feature of the set beyond the proscenium, however, is that the Birling family ‘residence’ seems at key moments to float on another plane, detached from any tangible, recognisable reality, but surrounded by a powerfully menacing music at times. 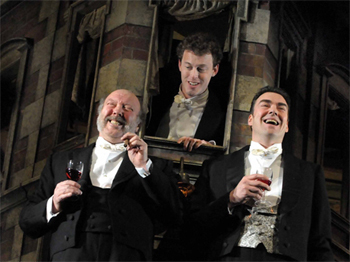 Priestley’s play is not, therefore, simply about class divisions; and this production suggests more than just that, too. Whilst it is a play about the deceptions and hypocrisies that can grip the world of the family as typical of a social class, it also presents the family as a unit of related individuals within it; about the essential isolation of family members when they confront realities within and beyond the walls of their world, the internal walls of their minds, which they have built in order to survive in safety whilst their actions lead to the sufferings of others. Sheila Birling can only be concerned to ask completely inappropriately and selfishly if Eva, at the centre of Goole’s questioning, was ‘pretty’. It is to the credit of all the cast that the sense of a family unit in a self-absorbing crisis, not acknowledging the selfishness that lies at its heart, develops powerfully against a backcloth of the world of poverty around them. The members of the Birling family chillingly retain a sense of ‘normality’ within an environment that increasingly appears as fundamentally abnormal. At two critical moments the ‘outsiders’, the ‘people’, those who do not share this privileged existence, appear almost as if in choreographed ballet scenes, immobile, silent, haunting. Priestley’s play, in fact, always suggested a sense of the Victorian ghost story. 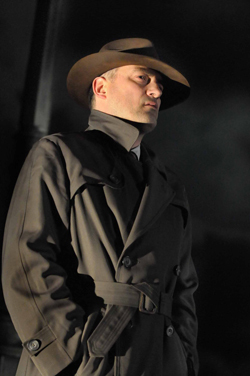 Inspector Goole’s name has the haunting echo of a troublesome, unexplained presence and he appears left on centre stage as an immoveable conscience figure, probing, infuriating the family, but equally acting as that mysterious dramatic presence that is essential for the unfolding of the troubling realities of the characters he confronts. One is reminded of the Norwegian playwright Henrik Ibsen (An Enemy of the People; Ghosts) in Priestley’s ability to use a character to cross time and the sequential patterning of events to show how the past is always a persistent haunting present, again reminding us how central Priestley is to the issues which had preoccupied writers like Dickens and Conrad and contemporaries such as T. S. Eliot. Certainly in An Inspector Calls the ‘past’ of the opening scenes is also foretelling the future within the play and, in so doing, it destabilises the ‘normality’ of any reality that may be constructed. Chillingly Inspector Goole warns the Birling family that, unless human beings understand that lesson, ‘they will be taught it in fire and blood and anguish.’ In this context, for Priestley, and through the words of Goole in the play, there was not much difference between criminality and respectability. Readings of Plato’s political ideas of a commonwealth had been important catalysts in that early political search for a unifying structure for international relations and one can sense a fundamental idealism within the words of Inspector Goole which reflect that sense of value and moral commitment. It was to be strong for Priestley when he later worked for the early foundation of the Campaign for Nuclear Disarmament (CND). This production brings out all Priestley’s qualities as a playwright engaging with key social, political and personal issues that remain central issues today. It is a colourful, vigorous and memorable performance of a family and a community destroyed by greed and by the sole pursuit of self-interest. This is a beautifully choreographed and orchestrated production, using magical design and artistic contrasts to recreate the continuing and thought-provoking importance of this play about a wealthy business family who live in a world of dramatic twilights teetering on the haunting abyss. * John Donne’s passage is not a poem although it is widely and wrongly described as such. It is part of a much longer ‘Meditation’ in prose upon death and dying.